You have an awesome weblog of the Merckx lineup. I admire your completeness! Having rode many frames, I finally settled on Merckx as the most comfortable for long rides and had him build a track set from from Columbus Max tubing in reverse Motorola colors. It is a pleasure to race and look forward to riding more Merckx bikes. Nonetheless, your site is great...keep it up. Have you visited the factory outside of Brussels? I use to own 1 of the ADR frames just like the one pictured. 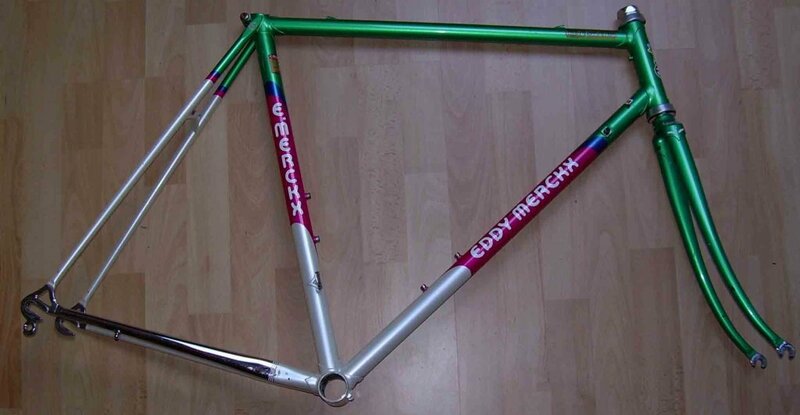 If anyone has a frameset in a 54 or 55 cm I want to buy it. Nice Pics. I still have my Merckx Corsa Pro ADR. Still a wonderful ride.